If you’re going to be near Beverly Hills over the next few weeks, you’ll have a rare opportunity to see a small, but fabulous, exhibition of world-class jewelry once owned by Oscar-winning actress Elizabeth Taylor. Among the eight signature pieces on display at Bulgari’s boutique on Rodeo Drive is the 23.44-carat emerald-and-diamond brooch that Richard Burton gave to Taylor as an engagement present. In December of 2011, the breathtaking bauble set an auction record for the highest per-carat price ever paid for an emerald. The final price was $6.57 million, or $280,000 per carat. 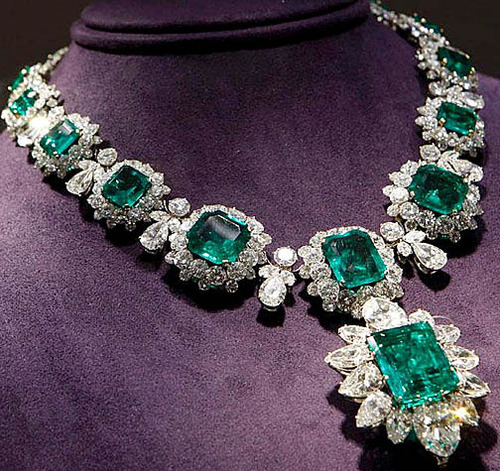 Upon their marriage in 1964 (his second, her fifth), Burton followed the brooch purchase with a matching necklace whose 16 Colombian emeralds weighed in at 60.5 carats. It sold at auction for $6.1 million. In total, Taylor’s jewelry collection – sometimes referred to as the Crown Jewels of Hollywood – fetched $116 million to set a world record for the most valuable private jewelry collection ever sold at auction. Interesting, one of the biggest buyers during that 2011 Christie’s auction was Bulgari, as the company reacquired eight of its own designs. 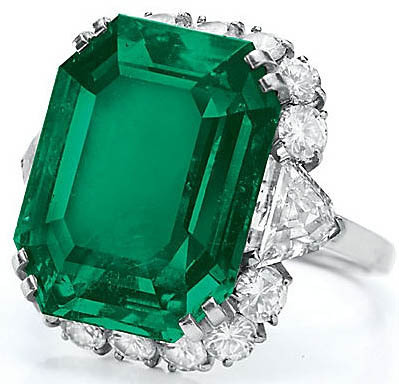 Other items on display include the first gift Burton purchased for his bride-to-be in 1962 — the “Taylor Burton fiancée ring.” The platinum ring features a 7.4-carat rectangular-cut emerald flanked by 5.3 carats of circular and modified triangular-cut diamonds. The piece sold at auction for $3.33 million. 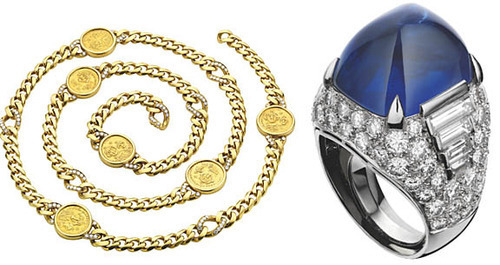 Jewelry lovers will also get to see Taylor’s diamond-and-gold sautoir set with six ancient Roman coins and a Trombino diamond-and-platinum ring complete with a 25-carat sapphire. The exhibition, which opened on February 20, will run through March 10.